Saludos, Yo he montado mi motor sin afectar el TI usando los orificios del casco. ¿Orificios del casco? No entiendo. Tus fotos no aparecen. ¿Qué agujeros específicamente? ...There is one valuable peice of info that I think anyone considering electric would want and I see from a picture you posted that it would be very easy to get. I have posted this before.. maybe sometime someone can take the time and get these numbers. You may have noticed that battery capacity is specified in watt hours. Ie, 915 watt hours for the larger battery. How much actual capacity you get out of a battery is somewhat influenced by the rate you use the power but this should be a good indication of what range you get out of an electric motor. For example, in that picture, the speed is 4.5 mph and the power being used is 273 watts. If you had the larger battery (915 wh), you can expect that at 273 watts, you would use up that 915 watt hours in 3.35 hours (simple math: 915 watt hours / 273 watts = 3.35 hours). At 4.5 mph, you would then go 15.1 miles (also simple math.. 4.5 mph * 3.35 hours - 15.1 miles). Simple math involved here. no snake oil and exactly what I would want to know before buying electric as this result in not clouded by sail or pedal power. Add in all three at the same time you have no idea exactly what the electric contribution is. So what would be interesting is to get the power vs speed readings for each of those electric motor setups. It would then be easy to compile a table showing what the range vs. speed would be for a given battery capacity. Anyone with electric willing to get some simple data? Just note the power display for say 1 mph, 2 mph, 3 mph.. etc up until peak mph. Post results here.. it would be very interesting. I'll start bringing a notebook with me and attempt to provide you with this data. I apologize that this took so long, but it literally took all season to find a day were conditions were perfect enough to obtain this data without any other factors interfering. These numbers were taken on a day where there was virtually no wind, calm seas, and no water disturbances from other boats, as close to perfect as it ever gets. Using this data we can determine the Speed vs Run Time with each Torqeedo battery available for the 403: the 320 WH, the 533 WH, and the 915 WH. I did not include the data for 1.0 MPH. This is not a viable, sustainable speed because the TI's rudder does not respond well at a speed this low. And also the Speed vs Range for each battery. Disclaimer: I'm ok with people using this as a general baseline, however I've mentioned many times before that these figures are theoretical only and that real world conditions can and will change them radically. If you were using the 403 in unfavorable conditions such as against a strong headwind and strong currents or waves, the results would decrease significantly. Whereas if you were in favorable conditions such as running with the wind, current, and waves, or using the sail or pedals along with the motor, the results would increase significantly. So please keep that in mind. Also you rarely travel at the same speed, at any time you may choose to go slower or faster. If you own a 403 then you already know that the onboard computer will continually calculate your remaining run time and range in real time given the current power consumption, battery charge, and speed. This will be your most accurate data. If you don't own a 403 then you can use the charts above for a general idea of what to expect. I'm looking to purchase the Suzuki 2.5 hp motor, however there is no Suzuki dealership within nearly 100 miles of me. Has anyone purchased this motor online? If so could you recommend a reliable seller? I'm concerned about getting service for this motor with no dealer nearby which is delaying my purchase. Mr Pro10, I just got my Suzuki from onlineoutboards. It was here (Florida panhandle) in exactly 24 hours. There is not much to “service” on it. You need a Phillips head screwdriver to change fluids. It is GREAT to sit beside while it’s running, we are at 5.5 hours use already! All these motors are very simple motors, and any parts are readily available on line , ( amazon prime same day delivery , etc), It’s pretty likely you know more about motors, than the kid they would asign to work on such a small motor. All the dealers are the same, if the carb is bad, they replace the carb, if the mag is bad, they replace the mag, just like cars, nobody fixes things anymore. If you smoke a piston or block, it costs more to repair than just buy a new motor. Lol you smoke these motors, they will find any excuse to void the warranty. An example is I gunked up the carb using ethanol gas, took to the dealer, they offered to put a new carb on, but not under the 5yr warranty, stating I used the wrong fuel. I took the motor home, took the carb apart, cleaned it, ( took about 20 minutes), didn’t cost a dime. Labor alone at the dealer was more than the cost of a new carb. Another example, I crashed and knocked the lower unit off one of my outboards, ( when hydrofoiling), not covered under warranty, I’ve wrecked quite a few props, ( not covered), etc, etc, etc. Think about it, if the water impeller goes bad, it’s pretty obvious, just order a new one on amazon prime for $12 bucks, in some areas you can get same day or next day for free. Don’t need a dealer for any of that. I’ve destroyed quite a few Hondas, but the typical damage self inflicted and is pretty darn obvious, when pressure boosting these things up to 8-10 hp with 36% nitrox. Nobody is goin to cover stuff like that under warranty, plus most problems are beyond the ability of the people the dealer would assign to repair these small motors, all the top guys are working on the $20k big 300 hp. outboards, I/O units, and replacing the big 5.0 engines, ( that’s where they make heir money). Anything to do with these tiny motors lets just say you overwork your welcome at any dealer really fast. I wouldn’t worry too much about being near a dealer, they don’t want to touch these motors with a ten ft pole. You guys are right, I'm overthinking this. It's a dependable motor and there's really no service on it I can't handle. No real need for a local dealer. I'm just still uptight after the experience I had with the Tohatsu. I paid $1,200 for it and it ended up being a very poorly designed motor that was wholly unsuitable for the TI. When I realized this, I was certain I was out the cost of the motor. However, the dealer I purchased it from, Cabelas, was incredible. They said if I was unhappy with it they would take it back with a full refund. That floored me since i had it almost the entire summer. I highly recommend Cabelas to everyone now. I only wish they sold the Suzuki. So what I'm looking for now is any recommendations for a decent Suzuki online retailer. I see several but I have no experience with any of them. I bought a 2.5 hp Suzuki from: https://www.suzukioutboardteam.com and was pleased with the transition. I have been following this thread for some time and just started on my gas motor mount installation. I have a Torqueedo 403 that I am going to pull off and sell $$$ opting instead to go with the 2.5 Suzuki that I ordered from suzukioutboardteam.com a few days ago. Personally I don't want to keep both motors, I have a sail, peddles and Tow Boat US to make sure I get home. The 403 doesn't go as far or as fast as I want, it's about 7 miles to the good fishing ground and the wind always dies in the afternoon leaving me with a hot peddle home after a long day of fishing. I am going to mount the motor directly behind the rear seat forward just enough to allow for the live well to fit. I like the three bar solution used by Pro10is and will probably just replicate that with very few modifications. I like the spider wire tie-off that FE put on his lower end to compensate for some of the thrust from the motor. 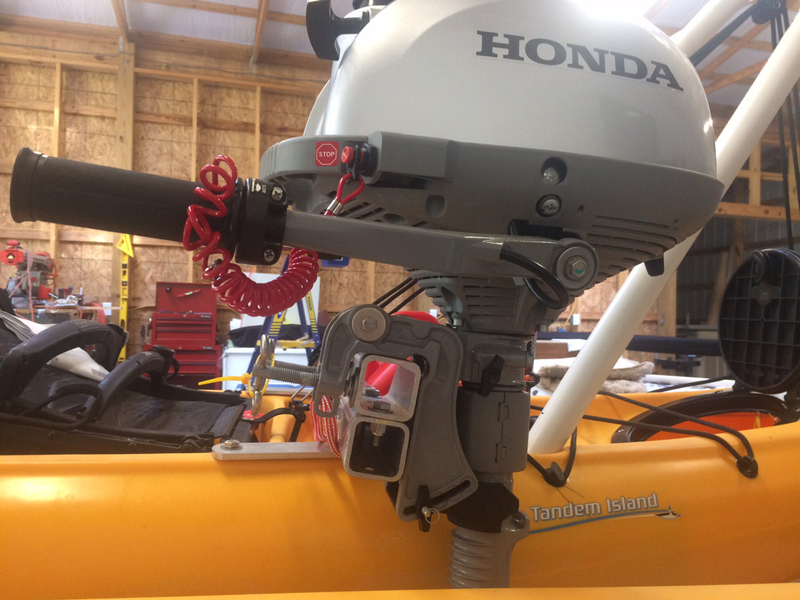 Question: I just bought a Honda 2.3 to mount to my TI (after researching for way too long, it seems the best fit for me.) I see 6" rise and 4" rise on the mounts from the photos on this thread. Will it really matter much? And any suggestions on how long the square tubing should be? I'm guessing 30" ? I prefer the higher (above the gunwale) mounting position for our motor. We set the top of the mount to be 8.75 inches above the gunwale. This is the highest usable height I could obtain. It allows us to motor through very shallow water--even shallower than we can pedal through. We have the Suzuki motor--so your lower unit may be shaped differently and may need to be mounted a bit lower to avoid cavitation. I used a very long mount which allows me to fasten the motor to either side, depending on what works best with the loading/handling. Wow, haven't seen anyone else that high. It would be nice to be able to get in some very shallow water around here. Thanks for the feedback.